HomeAll postsGeneralHow to teach students about academic writing? What should I teach my students about writing? Diary submitted by Adam G.
When students are preparing for exams a crucial part is the writing. Especially when the student is aiming for a high level such as C1, the writing needs to be clear, concise and often academic. 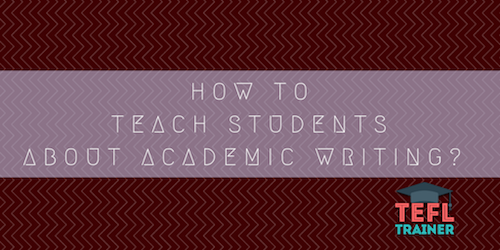 So how do you teach students about academic writing and the best ways to structure essays? This diary will reflect on my experience of teaching academic writing skills and how I learnt the best methods to deliver this in a lesson. One of my regular students was preparing for the IELTS exam and as part of this had to do two pieces of writing. In IELTS one writing takes the form of more of a report and the other an essay. So, we had spent time looking at the best ways to structure both writings and also the language that she should use. Combining my own knowledge of academic writing from university and using online materials to show to my students I had developed clear ways to structure lessons to make sure the student learns as much as possible. This particular student was already at a C1 level of speaking and her writing was very good but she was struggling with a piece of writing for her university course, her dissertation abstract, but written in English. The student was studying Environmental Engineering, a topic I know nothing about. So, this posed a challenge to me. However, as I explained I had prepared many lessons on how to teach academic writing. What I found very useful was to use material online specially a detailed slideshow showing all of the steps that should be taken when beginning a piece of academic writing. Despite this being very useful it didn’t fully solve the issue she had as a dissertation uses technical terminology and is not written for a layman audience. So, I had to change up the plan a bit. In the end, we went through the abstract by asking her to explain what she wanted to say in the simple English and then writing down a basic structurally correct sentence or paragraph and then adjusting it to meet the required academic level. This way of working with the students is something that I use quite a lot, no matter what level. As I believe that by making them tell me a simple sentence they are constantly learning the correct way to structure sentences in English and then by adapting that for an academic town they are learning new language and writing styles that they can continue to utilise.